First Toronto, and now Calgary, has done the moral thing. Both cities have passed a bylaw banning shark fins. Consumers of shark fin soup must consider the effects of declining shark populations on our delicately balanced ecosystem. First Toronto, and now Calgary, has done the moral thing. Both cities have passed a bylaw banning shark fins -- and thankfully even with the support of young Chinese Canadians anxious about our damaged environment and depleted oceans. Calgarians have enthusiastically backed the new law, including members of the Chinese community, where the delicacy has been prized for centuries. I am vegetarian, but I am told that shark fin is tasteless, though its chewy-crunchy texture is distinctive. Chefs give the soup different flavours by adding special ingredients to the broth. Demand is high purely because shark fins themselves are rare and expensive. Hosts wish to impress and flatter diners by serving such exclusive fare. The diners know it is expensive, and the host knows that the guests know this. It really all comes down to status. But even if diners were to like the taste, is it worth feeding our indulgences by subjecting these fish to such brutality? Once only a delicacy served at Chinese weddings, shark fin soup is now also served at business lunches across the Pacific rim. Shark populations are consequently declining at alarming rates, threatening over half of shark species with extinction. And yet, with increasing prosperity in China, the demand for shark fin is soaring. Perhaps the most outrageous aspect of it all is the grisly way sharks are harvested. The following information is not for the fainthearted, but it still needs to be stated. Man's inhumanity to animals is epitomized by the way millions of sharks are slaughtered each year to cater to our extravagances. After the fish are captured, their fins are chopped off while they are often still alive. They are then thrown back into the treacherous waters to die a lingering death. Sinking to the bottom of the ocean, the fish can no longer look for food or fend off harassment by other creatures. Many simply rot till they die. This is hardly the image of sharks one sees in movies like Jaws. 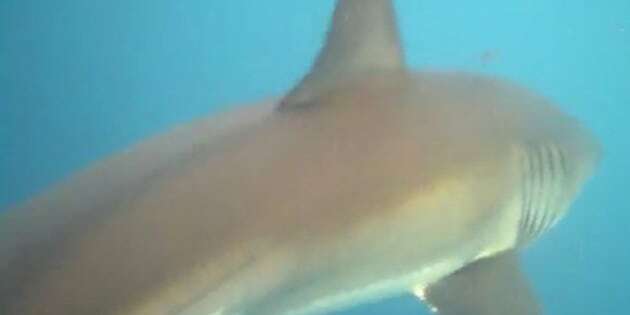 Despite their malevolent reputation, sharks are actually very gentle creatures, and vulnerable to such predation by humans. It is therefore heartening that Toronto activists like Rob Stewart of finfreetoronto.com want to take their message to the rest of the country. The delicacy still enjoys support among some Chinese in Canada. Hopefully Chinese Canadians everywhere will ultimately boycott the product as their counterparts in Calgary recently did; 70 per cent of Chinese Calgarians supported the ban. Sharks continue to be harvested to cater to an ever-growing demand. It is therefore imperative that something is done to lessen the demand. Some opponents of a ban have suggested this is tantamount to marginalising Chinese culture. But is it important to preserve a part of a culture that carries with it the stigma of inhumanity? Consumers of shark fin soup must consider the effects of declining shark populations on our delicately balanced ecosystem. Not only must we act responsibly and humanely toward the animals that inhabit the earth's land and waters, we must also ensure an abundant, clean and fertile world for posterity. Rob Stewart of finfreetoronto.com is working hard to gather support for a shark fin ban. Toronto and Calgary have taken the lead, but a shark fin ban must occur nationwide. Let us preserve our environment for a safe, green world.